Be on the lookout! Tomorrow during National Night Out, Seattle police officers, firefighters and emergency management staff will be out in full force spreading the word about AlertSeattle – the City’s new, real-time emergency alert and notification system. 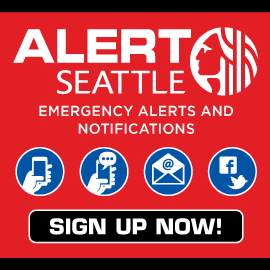 AlertSeattle is a free service that allows you to sign up online to receive customized alerts via text message, email, voice message, and on social media (Facebook and Twitter).This service is provided by the City of Seattle at no cost; however, message and data rates may apply. In addition to emergency alerts, you can also choose to receive customizable community notifications. These will include notifications about severe weather, safety, health, utility disruptions, major traffic incidents, and more. Follow AlertSeattle on Facebook and Twitter too! Your information is private and will not be used or distributed in any manner. This system is available to anyone who lives, works, travels through or visits Seattle. For more, go to: alert.seattle.gov. This entry was posted in Uncategorized and tagged AlertSeattle, ballard, emeregncy alert system, Seattle, west woodland by West Woodland, Ballard. Bookmark the permalink.